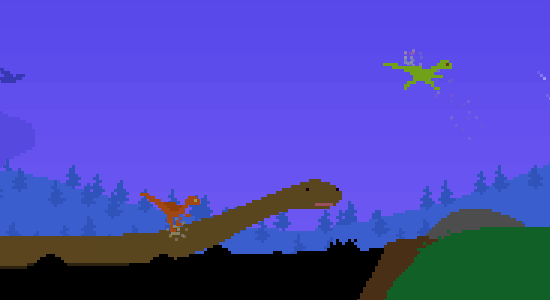 Dino Run is the best game of 2008. 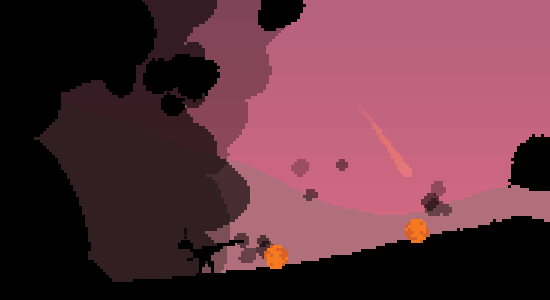 The premise is simple: a meteor hits the Earth, sets off a doom wave, and all the animals start running. A light homage to Pitfall, Dino combines the the exhilirating platform sprinter vibe of Sonic with the expressive vector graphics of Another World, the addictive multiplayer of SNES Mario Kart, a terminal micromusic soundtrack, and hats - really nice hats. 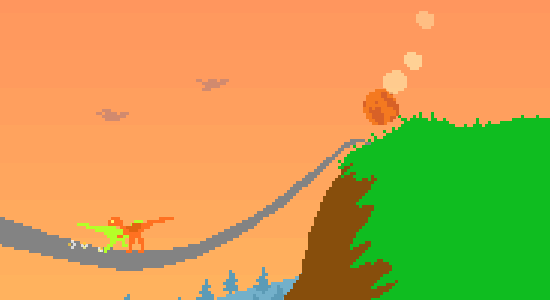 All hyperbolic comparisons aside, I had a fascinating experience with Dino Run that has set questions of intimacy and co-presence loose in my mind for the last few days. I was up late the night of Dino Run's release finishing school work. I took a break, found an acquaintance on IM, and convinced her to do the same. We agreed to meet up in "Dino Central" and, after a little messing around, we were running for our lives. 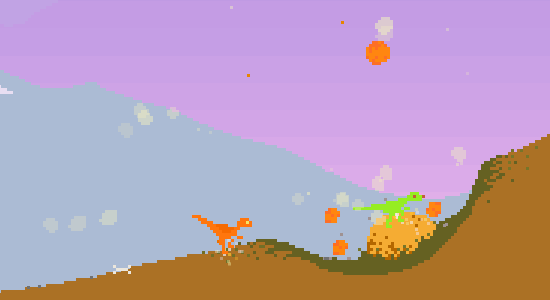 Having played the game a bit in lab that afternoon, I quickly leapt ahead of my dino buddy. Yet, despite every indication to keep on running, when I saw her little icon falling behind on the race map, I stopped, turned my dino around, and ran left to find out if she was stuck! Critical moment here, folks. The decision to turn around is counter to the very core imperative, not to mention the driving narrative, of Dino Run: GO TO THE RIGHT. I caught up to her easily and the two of us ran through the rest of the map within a few hundred pixels of one another. Why didn't I just blast through the level and leave her behind? It wasn't the same impulse that would cause me to go easy on a n00b in Street Fighter or for my sportier friends not to stuff me everytime I take a shot when we play (irl) basketball. I didn't turn around simply because I wanted to make the game fun. I turned around because to run ahead would have been to abandon her. I can recall experiencing only one other moment of similarly strong emotional projection. Last year, a friend from my place of work invited me to visit a particularly spectacular build he had completed in Second Life. We met up in-world sometime in the evening and he lead me around his Zen garden, water fall, and tea house. As the tour came to an end, he lead me up a mountain to a tiny notch he'd carved for two avatars to sit and look out over the sea. Clicking on one of the orbs he'd installed on the ledge, I saw my short, gender-ambiguous avatar begin to snuggle up against my colleague's well-dressed male avatar. I immediately felt like I had made a social faux paus and was compelled to apologize. After just a few minutes in SL, an environment I did not visit often, I had so fully given over my sense of self to my on-screen avatar that the nerves along my skin reacted to the unintended intimacy. Goosebumps (piel de gallina) stood visible along my forearms and my heart sped up. My body was reacting as though it had actually touched someone inappropriately rather than the avatar I was controlling with minute movements of my hands and wrists. As my friend and I ran along the back of apatasaurus, I felt a similar blurring of boundaries, a sense of screen empathy. My dino-friend and I do not live in the same city and we know each other primarily through our work interests. Meeting up to play Dino Run seemed no different than chatting on gtalk until I actually saw our dinos running around in their pixelated world. It felt unexpectedly as though we were changing the terms of our friendship. Rather than work buddies, we are now friends who get together occasionally for recreational activities, however virtual they may be. There is something both liberating and frightening about this experience of the projected self. It challenges the perceived edges of selfdom. If my selfness is so quick to jump ship for a cute little pile of dino-pixels, what is keeping it coming back to me everytime I turn the browser to another URL? Or is the self constantly shifting when I am connected to the network? Is my experience with the little dino just a more tangible manifestation of an everyday leapfrog: from username to inbox to avatar to photoshop tool to blinking cursor?